As we move into summer, switching our fans back on and sipping frappuccinos instead of lattes, it’s important not to forget about members of our multi-species households! Below you’ll find some tips to help you keep your furry, or scaly, friends comfortable. One of the things we love about our dogs is their willingness to go anywhere and everywhere with us. But, that enthusiasm can quite literally get them burned. The pads on the bottom of dogs’ feet are very sensitive, much like the bottoms of your feet! Make sure your dog doesn’t walk on hot asphalt and that the pavement is cool before letting your dog trot on it. To know whether or not the ground is safe for Fido, place the back of your hand on it. According to an article by The DoDo, you should be able to leave your hand there for more than five seconds comfortably. If you can’t, the ground is too hot for your dog. You can take extra precautions by walking your dog earlier in the morning and later in the evening to avoid peak heat hours. Other dangers for dogs on the go include hot cars. Do not leave your dog in a vehicle unattended. The Humane Society even advises against leaving your dog in the car with the air conditioning running. Unlike another human, your dog can’t text or call you if they start to overheat. Instead, you need to be there to see if they’re exhibiting signs of distress, such as a change in breathing, behavior, or appearance (a dog’s tongue and gums can tell you a lot about their condition). Visit the Humane Society website to learn more about signs and symptoms of overheating. You can avoid taking your dog for a car ride but leaving them at home alone may be inevitable. Ensure that you leave the air conditioner running for your pet and leave out plenty of water. Just like us, dogs need to stay hydrated. Doggy popsicles or ice cubes can also help with hydration! Keep in mind that while most of us probably don’t walk our cats, all of the above also applies to them. Hydration may be an even bigger issue for felines if you don’t already have a fountain. You see, cats are more likely to drink from a source of running water than still water in a bowl. To keep your feline in tip-top condition this summer and ensure optimal hydration, you may want to invest in a water fountain. 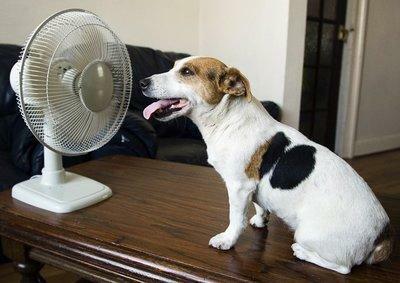 Dogs and cats aren’t the only pets who need some help staying cool! Your pet bird needs proper ventilation and air conditioning during the summer as well. Better Pets and Garden points out the importance of keeping the underside of the wings clean and dry, as birds hold their wings out to cool themselves down. Furthermore, you can touch the underside of the wings to determine if your bird is too warm. Many birds also appreciate a spritz of cool water. You can offer one by setting up a bird bath for their wild friends. Much of the above concerning simple temperature applies to rabbits, ferrets, and guinea pigs, but be sure to research the specifics a little further. For instance, did you know that rabbits let off heat through their ears, so you can mist the ears to help keep them cool? Ferrets, who also lack the sweating mechanisms we have, stop their energetic play and burrow to stay cool. So, try to let them rest rather than instigating playtime. Guinea pigs, much like rabbits, rely considerably on hydration from food, so it’s ideal to integrate vegetables and fruits rich in water content into their diet! Finally, keep in mind that even when summer temperatures are relatively mild, humidity may make them unbearable for your pet, especially because they don’t sweat like we do. Be extra cautious when humidity is high, and consider a dehumidifier if your home seems to trap the moisture particularly well!